Terrific performances in all the three departments helped India crush the West Indies by 224 runs in the fourth One Day International (ODI) at the Brabourne Stadium in Mumbai on Monday. With the clinical win against the visitors, India now lead the five-match series 2-1 with one match to go. Left-arm pacer Khaleel Ahmed (3-13) and wrist-spinner Kuldeep Yadav (3-42) starred with the ball as India wrapped up the Windies batting line-up for 153 in 36.2 overs. Chasing a mammoth target of 378, the visitors got off to a poor start with Bhuvneshwar Kumar dismissing Chandrapaul Hemraj (14) in the fifth over. Shai Hope (0) and opener Kieran Powell (4) followed Hemraj soon thanks to some brilliant display on the field from the Indian fielders. With the Windies team reeling at 20 for three, Khaleel showed no respite as he tore apart the visitors' middle order. The youngster dismissed Shimron Hetmyer (13), Marlon Samuels (18) and Rovman Powell (1) in quick succession helping India tighten their grip on the match. Spinners Kuldeep Yadav and Ravindra Jadeja then wrapped up the lower middle-order helping India register a comprehensive victory. Khaleel and Kuldeep clinched three wickets each while Bhuvneshwar Kumar and Ravindra Jadeja bagged a wicket apiece. 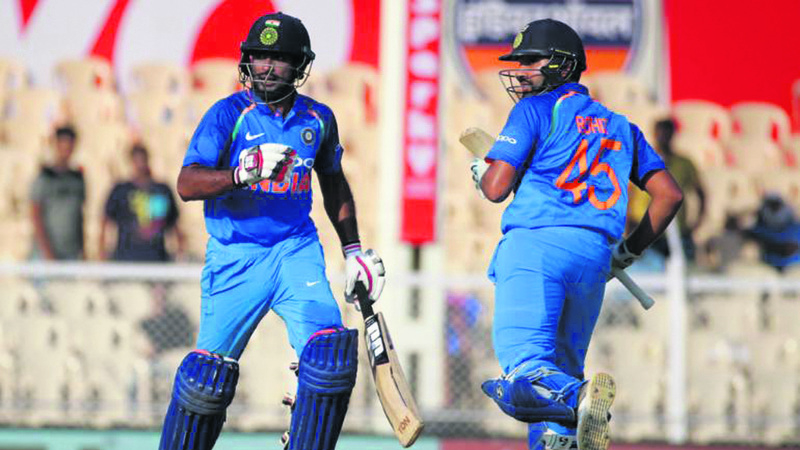 Earlier, riding on centuries from Rohit Sharma and Ambati Rayudu, India scored a formidable total of 377 for five after electing to bat. Rohit and Rayudu set up a terrific 211-run partnership for the third wicket as both the batsmen clobbered the bowlers all around the park. Sharma played a 162-run knock that included 20 boundaries and four sixes while Rayudu slammed eight boundaries and four sixes in his 100-run knock. Towards the end, MS Dhoni (23 off 15 balls) and Kedar Jadhav (16 off 7 balls) cameos propelled India past the 350-run mark. Kemar Roach was the highest wicket taker for the Windies, finishing with figures of 2-74. Despite the Indian captain’s third successive ODI ton, West Indies managed to pull off a 43-run win in the third ODI in Pune and level the series 1-1. West Indies made 283-9 with comeback pacer Jasprit Bumrah taking 4-35 and India replied 240 all out in 47.4 overs with offie Ashely Nurse (2-43) and Marlon Samuels (3-12 in 3.4 overs) – who bowled Kohli - hurting them the most. Skipper Jason Holder got the pivotal scalp of MS Dhoni (7) caught behind. Kohli scored 107 off 119 balls with 10 fours and a six. The rest of Indian batsmen scored 127 off 167. It was Kohli’s 23rd ODI ton while chasing a target and only the third in a losing cause after Napier (123 vs NZ, 2013-14) and Canberra (106 vs Aus, 2015-16). Riding on terrific century from middle-order batsman Shai Hope (123 not out), the West Indies team salvaged a draw against India in the second ODI in Visakhapatnam. The 24-year-old played brilliantly under pressure but failed to take his team across the line in a final-over thriller. With five runs required on the final delivery, Hope could only manage a boundary as both the teams ended on identical scores of 321. Earlier, in the first innings Virat Kohli produced another masterclass as India scored 321 runs for the loss of six wickets. Continuing his terrific run with the bat, Kohli notched up his 37th century in ODI cricket, scoring an unbeaten 157 of just 129 deliveries.